Ok, so acai bowls are pretty trendy right now. But we don’t care, because they’re awesome. If you haven’t tried yet, it’s basically a smoothie in a bowl, but with great, usually nutritious toppings. Acai berries are a great addition to a healthy diet. Acai can aid in weight loss, promote skin health, help digestion and boost your immune system, among many other benefits. Beyond the acai bowls you can find at Jamba Juice and other local smoothie/health food stops, there are tons of recipes out there to make your own. The acai berry is most commonly found in the Amazon rainforest, which make them somewhat difficult and expensive to attain. However, acai in powder form is available at Whole Foods and online, and makes it easy to create your own bowl right at home. 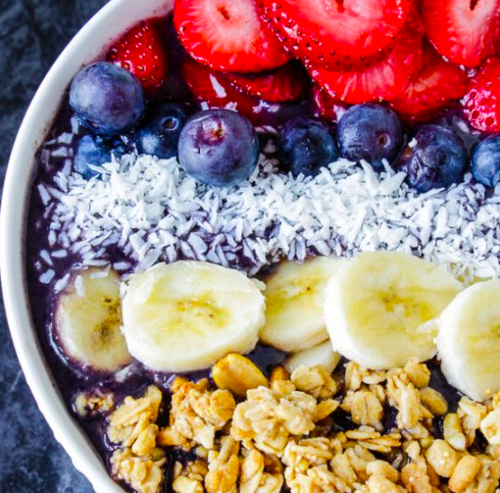 Try one, like this triple berry coconut bowl from Natural Chow. Or this one from Lean Green Nutrition Fiend, that includes berries and granola. Treat yourself to a breakfast packed full of protein and energy to start your day. Show us your recipe on Twitter @creatopspray!